A new phase of Polynesian expansion in the Pacific is occurring. All the Pacific islands are uninhabited, except for Australia, New Guinea and the Solomons. A new phase in technology is beginning in Australia, and the migration of the ancestors of the Polynesians has begun from south China. The ancestors of the Polynesians are beginning to settle the islands of the Pacific. A new phase in technology is beginning in Australia, and the migration has begun from south China of the ancestors of the Polynesians. The ancestors of the Polynesians have reached as far east as Fiji. A distinctive Polynesian culture is now evolving. Distinctive Polynesian societies are evolving on the various Pacific islands. The Polynesians have settled Hawaii and Easter Island. The Polynesian colonization of the major Pacific islands is in its final phase. Long-distance voyages remain a part of the Polynesian way of life. Polynesian colonists discover New Zealand. The first European sailors have now appeared in Oceania. The first permanent European settlement has been established in Oceania, in south-west Australia, which has been claimed for the British empire. European missionaries and traders are active throughout the Pacific. The Pacific islands are falling under European control. All the Pacific islands have fallen under foreign control. Many Pacific islands were caught up in the fierce fighting of World War 2. Many new independent nations now dot the Pacific Ocean. In Australia, the long dry spell is giving way again to a wetter climate, much like that of the present day. This period sees the emergence of long-distance trade routes, which in turn stimulates the quarrying and manufacture of stones and stone artefacts on a proto-industrial scale in some favoured locations, for distribution over a wide area. In Polynesia, there is a new phase of outward expansion into the Pacific: Tahiti and the Society Islands have been colonized from Tonga and Samoa, and the Marquesa Islands have also been settled, from Samoa. The motivations for such long colonizing voyages are largely to be found in the immense, semi-divine prestige attached to founders of new settlements; in a very status-conscious society such as the Polynesian, this was one of the few ways in which a junior member of a leading clan could found a high status clan of his own. 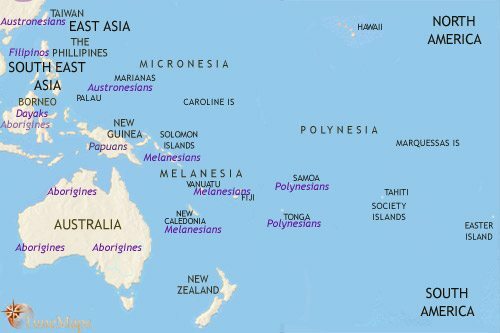 The islands of Oceania are uninhabited, with the exceptions of Australia, New Guinea and the Solomon Islands. Australia was first settled some 40,000 years ago – at first along coasts and river banks, later (from as late as 5000 BCE) inland. The move inland may have been connected to a rise in sea levels, which inundated coastal areas and also isolated populations on new islands, especially in Tasmania and the Torres Straits islands. The inhabitants – today known as aborigines – live a Stone Age hunter-gathering lifestyle. New Guinea was also settled about 40,000 years ago. From c.5000 BCE, agriculture, based on tropical crops such as taro, yams and bananas, developed in the highlands of the interior. On the coast, where tropical diseases kept the population sparce, the hunter-gatherer lifestyle prevailed. In Australia, a new cultural development has begun, with the emergence of a new toolkit based on small, finely finished flaked stone implements to make knives and shafted axes. The dingo is also introduced about now. These developments are evidence for contact with peoples from South East Asia, but they are probably at least as much to do with the climate becoming drier. Smaller implements allow for a more mobile lifestyle needed to cover a wider range of territory in search of food. Far to the north, in southern China, population movements are taking place which will have a huge impact on Oceania in the millennia to follow. The ancestors of today’s Austronesian peoples (of which the Melanesians and Polynesians are examples, as well as Malays and Madagascans) are migrating from south China to Taiwan at this time. They take with them their Stone-Age farming culture and well-developed fishing and navigation techniques. In Australia, the shift to the new tool kit of smaller and finer stone implements is taking place at different times in different places. The process is probably not a peaceful one – scenes of violence portrayed in cave paintings probably date from around this time, reflecting a fierce competition for resources between different groups. These technological changes seem to have been accompanied by changes in religious beliefs and practices, with old sacred sites abandoned. This may indicate the replacement of older populations by incoming ones. To the north, Austronesian migrants have now settled the coasts and islands of South East Asia, south to the northern coast of New Guinea, and as far east as the Solomon islands. At about this time they also embark on the first of their great colonizing ventures, when a group of them sail the 2500 km (1550 miles) eastwards across open water to settle the Mariana islands. In Australia, the new stone tool kit continues to spread, and leads to other changes: the existence of large base camps and cemeteries indicate larger, more stable tribal territories as groups coalesce or exterminate each other in seeking to secure food sources in the dryer conditions. Groups of Austronesians continue to migrate eastwards, reaching Fiji by 1300 BCE and Tonga and Samoa by 1000 BCE. They carry with them their cultural package known to modern scholars as the “Lapita culture”, marked in the archaeological record by pottery with distinctive decorations based on tattoo designs. This culture probably originated in southern China, and it is based on a mixed economy of horticulture and maritime subsistence. The people had pigs, dogs and fowl. By this date, almost all Australia is covered by the new technology based on the small stone tool kit. In the western Pacific, an inter-island trading system has developed, linking the Austronesian communities of New Guinea, the Solomon Islands and as far east as Fiji. The inhabitants of Tonga, Fiji and Samoa are developing intensive trading relations, which will, over several centuries, lead to the emergence of a common Polynesian culture in these islands. This culture is marked by some significant losses in technology, as well as some remarkable gains. There is a gradual disappearance of pottery and of the weaving loom. This must have been linked to a reduction in the Pacific Islanders dependence upon rice and millet, and a growing dependence upon tropical plants such as taro and bananas, as well as upon fish and meat. Pottery is useful for carrying cereal grains, but much less so in the new conditions of the tropical Pacific. In place of textiles the islanders increasingly use bark cloth. In this they develop high levels of skill, but weaving looms are not relevant to the process. Above all, the Polynesians develop further their boat building and navigation techniques, and later Polynesian societies were to produce sophisticated stone implements, elaborate irrigation systems, palisaded earthwork fortifications and monumental stone art. 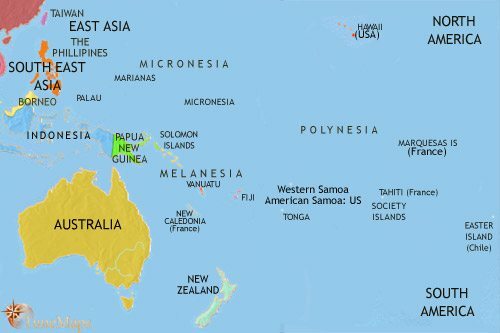 The newly settled Pacific islands are malaria-free, and have plenty of resources available for the newcomers to exploit. The different islands evolve different societies according to the local environment which prevails on each. Some of the larger islands, such as Tonga and Tahiti, develop hierarchical societies in which stratified ranks of chiefs dominate the population, while the inhabitants of other, smaller islands retain a more egalitarian society where high status does not necessarily confer political control. Long-distance inter-island contact between the far-scattered Polynesian islands persists on a regular, though infrequent basis. By this date, the Hawaian islands have been settled by Polynesian colonists from the Marquesa Islands, and Easter Island has been settled from Tahiti. This period sees the colonizing of the rest of the major islands of the Pacific, with voyages originating from the core area of Samoa-Tonga, Tahiti, the Society Islands, and the Marquesas. At some point around this time the sweet potato arrived in Polynesia. This has led some scholars to think that Polynesian sailors voyaged as far as the coast of South America. Others believe that these vegetables floated on the ocean currents to their new destination. Inter-island communication remains an important part of Polynesian culture, despite the long voyages this entails. There is evidence dating to this period for the rise of Tongan rulers to a position of pre-eminence acknowledged by local rulers in Fiji, Samoa and other islands. This pre-eminence apparently endured into the 13th century. Another example of continued inter-island links is the evidence for a second major colonization of Hawaii at around this date, this time from Tahiti. From this period a strictly-ranked hierarchical society began to take shape here. By about this time Polynesian colonists from Tahiti discover New Zealand. It is possible that the new arrivals have come on a single ship; however, the numbers of these ancestral Maories will soon multiply. This period also sees the early stages of the construction of the great statues on Easter Island. These are the product of a culture which gives high value to competitive building between chiefs, with each chief seeking higher status by building larger statues. In future centuries these statues will reach truly massive dimensions. Other Polynesian societies, Tonga and Hawaii for example, also engage in large-scale monumental building in stone, but on a less dramatic scale. The Maoris of New Zealand have quickly colonized both islands. The tropical crops they brought with them are unsuited to the temperate climate of most of the country, and the settlers adopted a largely hunter-gatherer lifestyle. The abundant wildlife, including the huge, flightless bird called the Moa, offered plentiful food. However, this has now been depleted, and the Maoris have learnt to eat native plants such as ferns, and to focus on growing their hardier crops such as sweet potato. This is only possible in the north; throughout most of South Island a thin population lives a hunter-gatherer way of life. 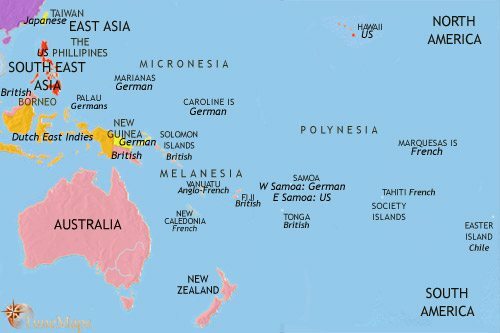 In other parts of Oceania, the Tongan “empire” has vanished; the rulers of Samoa, Fiji and other islands no longer recognize the Tongan ruler’s pre-eminence. The people of Samoa have developed a highly complex system of chiefly offices, arranged in an elaborate hierarchy of local and regional councils. In far distant Easter Island, the construction of ever-larger monumental statues continues, reflecting a fierce competition between chiefs. By this time, long-distance voyaging is mostly a thing of the past for the Polynesians. However, the first European sailors have now appeared in these waters, and some of the major islands, including Australia and New Zealand, have either been sighted or visited. On Easter Island, the last and greatest phase of statue construction suddenly comes to an end about now, although the inhabitants apparently continue to venerate these great objects. The social structure which produced the statues presumably continues largely intact. In around 1550 or a little later, sweet potatoes were introduced into the New Guinea highland farming culture. This has led to to much more intensive farming, and so to a large expansion of population. Over the past century and a half all the major Pacific islands have now been visited by European expeditions. The most famous of these were led by the British captain, James Cook, who between 1769 and 1779 visited Australia, New Zealand and many other islands. Other notable explorers were the Dutchman Jacob Roggeveen and the Frenchman Louis de Bouganville. During this period, the first European missionaries arrived, along with some traders and other adventurers. Sadly, with the Europeans came guns and diseases new to the islanders. Dramatic population decline followed, along with a destabilization of traditional societies and an intensification of warfare. On Easter Island, for example, most of the great statues were thrown down in a fierce civil war. The first permanent European settlement in the region has been established, in the form of a British penal colony on the south eastern coast of Australia. In recent decades, Christian missionaries, both Protestant and Roman Catholic, have been active on all the islands of the Pacific. European traders and whaling ships also visit the islands regularly, and some establish small settlements, for example on the coasts of New Zealand. The calamitous effects of European diseases and firearms continue to destabilize many island societies. On some places, civil wars end in the establishment of monarchies which rule the whole island, as on Samoa, Tonga and Tahiti; in all these cases, the kings have converted to the Protestant form of Christianity, leading to the wholesale adoption of the new religion (plus large elements of European culture) by their peoples. The British have now established a number of colonies in Australia, and the Dutch have started the first tentative colonization of New Guinea. American settlers – missionaries, traders and plantation owners – have established a major presence on Hawaii. Recent decades have seen several of the Pacific islands fall under European rule. The British have taken control of New Zealand, and have continued to expand their Australian settlements. The French have taken possession of the Society Islands, including Tahiti, and the Marquesas Islands (1842), and New Caledonia (1853 – which in 1864 becomes a French penal colony). Other Pacific islands feel the impact of Western contact almost as deeply. American settlers have tightened their hold on Hawaii, and on Fiji, European cotton plantations have been established, bringing in imported labour from other Pacific islands. Easter Island has suffered from devastating slave raids from South America. Of all the Pacific Islands, only Tonga, under its king George Tupou I (reigned 1845-93), has escaped the worst effects of European contact most successfully. In the last decades of the 19th and the first decade of the 20th centuries, all the Pacific islands fell under the control of foreign powers. 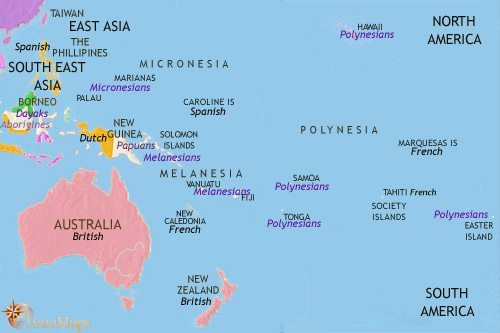 The nature and impact of colonial control has varied enormously from island to island, ranging from very little (as on Tonga and Vanuatu, both under loose British protection), to catastrophic (New Caledonia, where the indigenous people are by now being largely confined to reservations). Some of the islands have experienced changes of rule, the result of decisions taken the other side of the world in European capitals. Many of these islands have seen major changes of population, as European settlers have arrived or indentured labourers from other Pacific islands, or from as far afield as India, have been brought in. On all the islands, Christianity has spread rapidly. Both Australia and New Zealand have been made independent states within the British Empire. Recent decades have been ones of great change for the Pacific region. World War 2 had a huge impact on the Pacific region. Australia and New Zealand fought as Allies of Britain throughout the war, and it was the Japanese attack on the US navy in Pearl Harbour, Hawaii, which brought the USA into the war. Many island groups (the Carolinas, the Marianas, the Solomon Islands and New Guinea) found themselves caught up in fierce fighting between the two sides, while others played host to thousands of Allied servicemen. The post-war years saw the first tentative steps being taken towards independence, or alternatively full integration into the democratic processes of the western power to which they were attached (Tahitians were granted full French citizenship in 1946, New Caledonians in 1953, and Hawaii became the 50th state of the USA in 1959). On one island, the implications for democracy are not entirely welcome: native Fijians find themselves outnumbered by the descendants of Indian indentured labourers, who are potentially therefore in a position to dominate any democratically-elected governments. Most Pacific islands became independent countries in the final decades of the 20th century, or self-governing states within Western-led organizations (for example, the Marianas are a self-governing commonwealth under US jurisdiction, and Tahiti has the status of a French overseas country). Whilst for some islands, independence has brought stable democracies and increasing prosperity, other Pacific nations have experienced instability, and even violence. This has been particularly true of those places where the colonial period introduced new ethnic elements. Racial tensions between Polynesians and Indians has destabilized Fiji on several occasions, leading to military coups, and the Solomon Islanders have experienced full-scale civil war. Australia and New Zealand have been adjusting to new geopolitical realities in the world at large, seeing loosening ties with Britain and closer links to the leading Pacific powers of the USA and China. Tourism is a major industry on many islands, notably Tahiti and Hawaii.